Scientists and engineers have looked to nature for their inspiration for centuries. The field of biomimetics uses ideas from nature to solve complex human challenges. Synthetic biology, a more recent concept, focuses on the design of artificial devices or systems with biological or “bio-like” functions. This covers a wide range of applications – but perhaps the most fascinating biological “device” we could wish to emulate is the protein. Proteins are responsible for many of the key processes of life such as respiration and photosynthesis. They perform complex functions such as transferring electrons or breaking chemical bonds. But look closer into these systems and you quickly learn that the central part of the process is often not the protein itself, but the metal ion nestled inside the protein. The rest of the protein provides a sophisticated scaffold to delicately tune the properties of the metal ion. If you have ever looked at a periodic table, you will know that there are a lot of metals. However, if you start looking at nature, you quickly realise that biology is not particularly imaginative. Metal-containing proteins – metalloproteins, as they are called – tend to use metals from the first row of the transition elements. Many of these only involve iron or copper. On the whole, this is a matter of convenience. Some metals are more abundant than others. It makes sense that life should not need elements which are only found deep inside the earth’s crust. And yet, with the few metals that it has chosen, life’s processes are some of the most efficient chemical processes we know. This is where the importance of the protein becomes apparent. This carefully folded, complex organic molecule is what enables the simple metal centre to perform such an astonishing range of tasks. Given this knowledge, it might seem that we can achieve anything. Surely if there is a reaction that needs to be performed, we just need to choose a metal and design the right environment for it? Unlike nature, we have the entire periodic table to play with. The trouble is that proteins are so much more sophisticated than anything we can achieve synthetically. If we try and reproduce this biological activity we tend to fail. The other problem is that our required environments might contain features that are not found in native proteins. Also, proteins are stable only in a narrow temperature range and do not tolerate changes in their environment. So can we harness the advantages of nature but without the need for such enormous and complex molecules? A group led by Anna Peacock at the University of Birmingham is doing just this. They design miniature artificial proteins that bridge the gap between conventional synthetic molecules and the leviathans of biology. Peacock is particularly interested in metals called lanthanides. There are no known biological roles for these metals, but huge industrial interest. She has recently collected some remarkable evidence to back up this idea. This evidence comes in the form of a rather beautiful gadolinium complex. Gadolinium, a lanthanide metal, is used widely in applications such as medical imaging. Compounds containing the metal are injected into the body to enhance contrast in MRI (magnetic resonance imaging) scans. What Peacock and colleagues have done is to capture gadolinium ions inside short sections of synthetic protein. Many proteins form spiral structures called alpha helices. 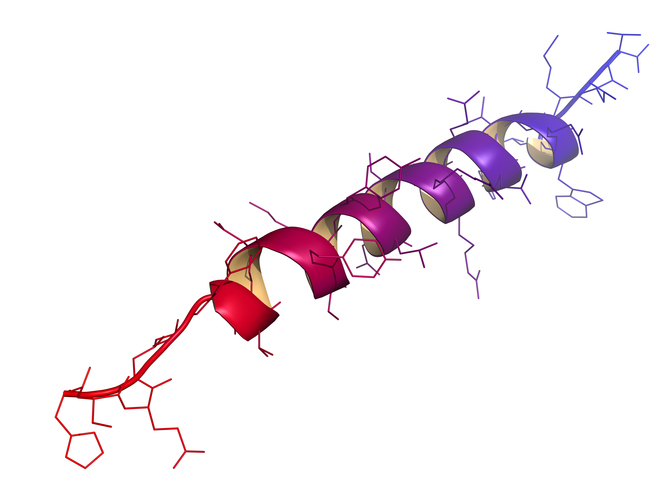 The new gadolinium miniature protein is made up of a gadolinium ion surrounded by three of these helices making a “coiled coil”. This is a bit like the multiple coiled structures you might see in a length of rope in which a coiled strong is then coiled again, multiple times to form something thicker and stronger. Coiled coils in themselves are not new. 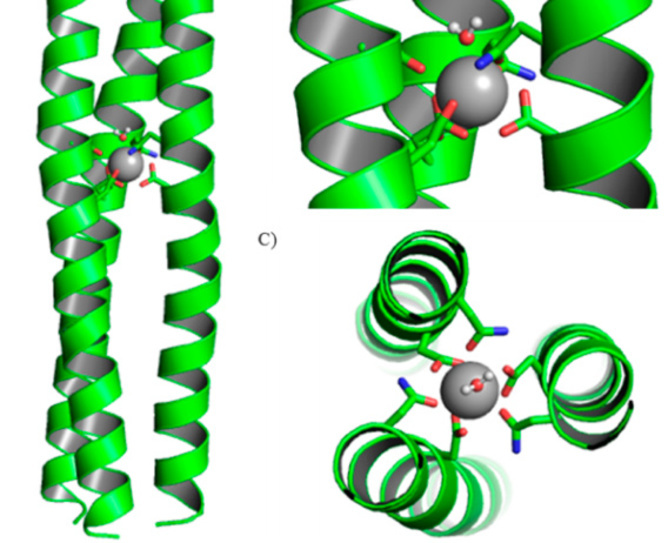 What is remarkable about this work is that by binding gadolinium inside a coiled coil, it is possible to achieve much greater MRI efficiency than standard gadolinium complexes made with small molecules. What is even more significant is that the position of the gadolinium within the coiled coil is critical to its function. This means that it is the extended environment of the miniature protein that is changing the properties of the metal.